With cycle hire facilities at Danish Camp, Willington, you don’t really need to bring your own cycle to enjoy the great trails in Bedford River Valley Park. Priory Country Park is linked to the Grange Estate, north of Willington by Route 51 of the National Cycle Network. At Willington, multi-user trails, built in 2008/09 loop alongside the River Great Ouse and directly across the Estate giving around 4 miles of safe, off-road cycling in the area in addition to Route 51. Because the River Valley Park is in the flood plain, it is flat and therefore the routes are very easy to tackle even for the most timid rider. Please note that members of Blunham and District Angling Club are permitted to access the river and internal lakes by car but are restricted to a 10mph speed restriction. For those wanting to explore further-afield, Route 51 connects Sandy to Milton Keynes passing through central Bedford and the Millennium Country Park at Marston Moretaine. 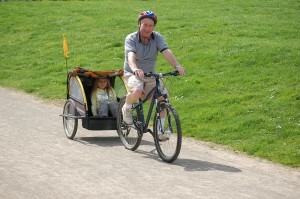 It also connects to Bedford’s developing Green Wheel; a cycleway that will, when complete, circumnavigate the town and link into the wider bridleway network.